Give your loved ones an unforgettable year of discovery and inspiration this Christmas. 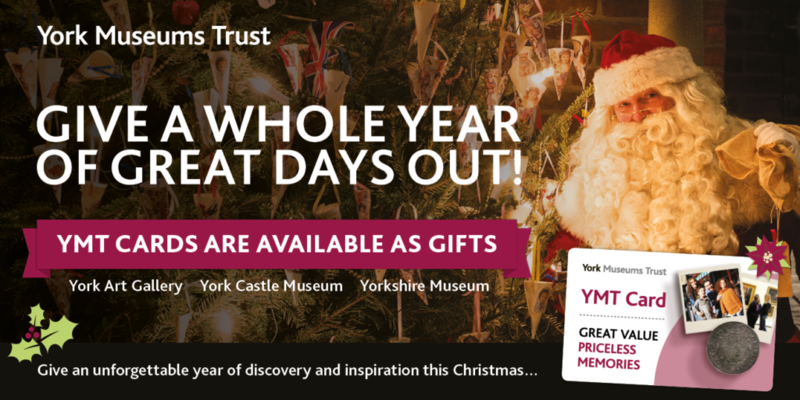 With a YMT Card they’ll enjoy unlimited free access to our three top York attractions – York Castle Museum, the Yorkshire Museum & Gardens and York Art Gallery – for a whole year. Plus, they’ll receive a range of exclusive perks too, including preview and private view invitations, priority booking, discounts in our shops and cafes and regular e-newsletters filled with behind-the-scenes news. And each YMT Card holder can take up to four children under 17 with them for free! Better yet, your gift will also help to support YMT, as a registered and independent charity, in caring for the 1.8million treasured historic and artistic objects, 12 acres of botanical gardens and 10 listed buildings entrusted to us, and in bringing world-class art and culture to York through our special events and exciting new exhibitions. Give a year of great days out this Christmas. Visit one of our admission points, call us on 01904 650345 or email ymtcard@ymt.org.uk today! Click here to find out more about the YMT Card on our website.